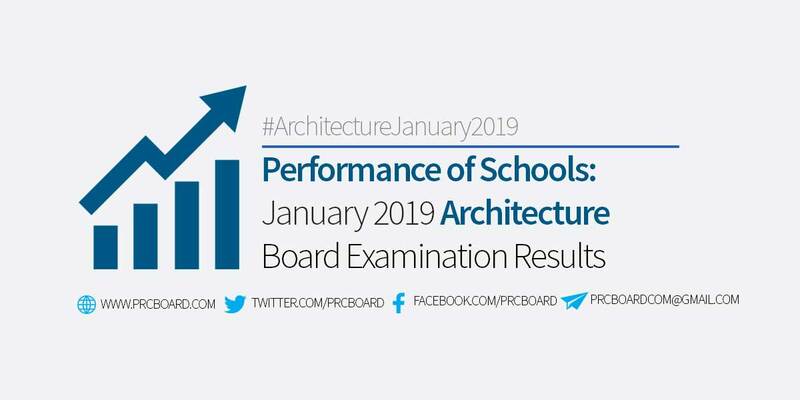 MANILA, PHILIPPINES - The Professional Regulation Commission (PRC) announced the top performing schools in the January 2019 Architecture ALE board exams three (3) working days after the last day of exams. The official results include the official list of passers, top examinees, performance of schools, oath-taking schedule, registration requirements, among other important announcements. PRC recognizes the top schools (colleges and universities) in the Architecture Licensure Exams (ALE) for January 2019. Shown below is the complete list of schools' performance for Architect licensure exam as well as the top performing schools with 50 or more examinees passed and with at least 80% overall passing percentage; as per Commission Resolution No. 2010-547 series of 2010, courtesy of PRC. PRCboard.com is among the trusted websites that provides timely and reliable information in any board examination conducted by PRC and other related government agencies. For verification, we recommend to refer to PRC official website. Meanwhile, to keep updated on the Architect board exam result for January 2019, we advise our visitors to bookmark this page, visit PRC official website, follow us at our social media pages via Facebook and Twitter or join the members discussions at our Facebook Group.